Preparing your own meals might seem daunting, especially if you're conscious of time. But fear not, because you're about to discover the many uses of a food processor. When Cuisinart introduced the first version of this miracle machine, it changed cooking forever. Once you know how to use it, it eliminates the need for pretty much all your manual chopping and slicing and replaces it with a lightning quick alternative. This 2-minute video shows a lot of those uses in action. Note that they use 'milling' twice which is why they came up with a list of 14! There's a ton of different recipes that a food processor makes so much easier and I'm going to tell you about five of them right now. Shall we get cooking? It might seem hard to believe, but people actually used to line up for the opportunity to churn butter. Back in the day people tried that tedious job for fun. What's not hard to believe, is that churning your own butter isn't popular at all these days. I think it should be though: it's the easiest thing in the world with a food processor. Of course, some people make their own butter by filling a bottle with heavy cream and shaking it until their arm gets tired. 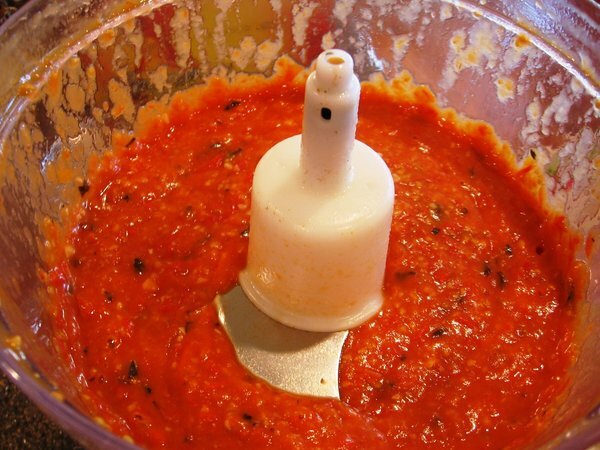 But with a food processor, you can replace that arm shaking with three easy steps. Step one: Put the cream in the work bowl while the S-Blade is equipped. Step two: Set the machine to pulse until the cream congeals. Step three: Drain out the buttermilk. And what do you know? Ready to eat, entirely homemade butter! And why stop at regular butter? You can make your own peanut butter too in less than five minutes. Once again, use the machine's standard S-Blade. Then fill the bowl with peanuts and let it run until it's smooth. Or if you like crunchy peanut butter, that's fine too. Just use the pulse function until the consistency is to your taste. Your food processor is up to any task. While you're at it, why not give some other, less common nut butters a whirl? Almond butter, cashew butter, hazelnut butter. All worth a taste, and all possible with a food processor. I don't need to tell you that buying jars of pasta sauce is a little bit of a gamble. We all know the feeling of emptying that jar into a pot to find it's got those chunks of onion that you hate with a passion. Or maybe it's chili peppers you hate? Or coriander? Or garlic? 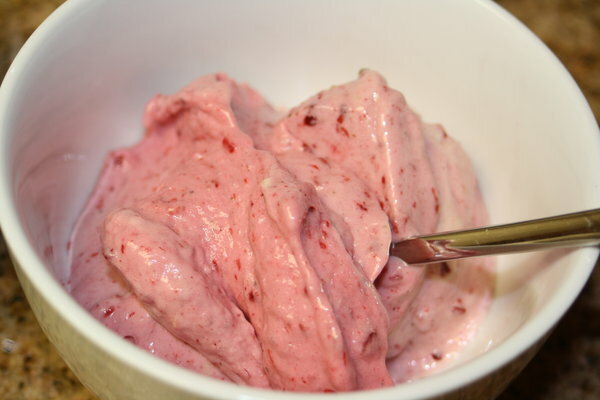 There's never going to a perfect blend of your favorite flavors unless you do it yourself. But lucky for you, you've got a food processor. Get whatever ingredients you want together in the work bowl, and get that S-Blade spinning. Once that's finely minced, you'll never have the irritating job of picking out those chunks of onion again. Now this might seem like something you could achieve just as easily with a blender. Well, if you want to learn more about the differences between these machines, why not check out our article on that very subject? When meat is ground, there's a whole lot of different ways to experiment with it. But wouldn't you like to be in control of the freshness and quality? If you grind it by yourself you can do just that. Ground meat always cooks better when it's on the fatty side, so in the case of beef, pork and lamb, a shoulder cut is your best bet. For chicken and turkey, those birds are naturally leaner anyway. If you go for the dark meat you'll get as much fat as possible. I'd advise you to chill the meat first so that it chops cleanly and the fat doesn't melt. So slice the meat into 1-inch cubes and then place them in the freezer for about twenty minutes. Do not let the meat freeze all the way through. A chilled blade will help too, so take your S-Blade out and stick that in the freezer with the meat. Once the twenty minutes are up, fill the work bowl to about half with meat cubes and commence grinding. 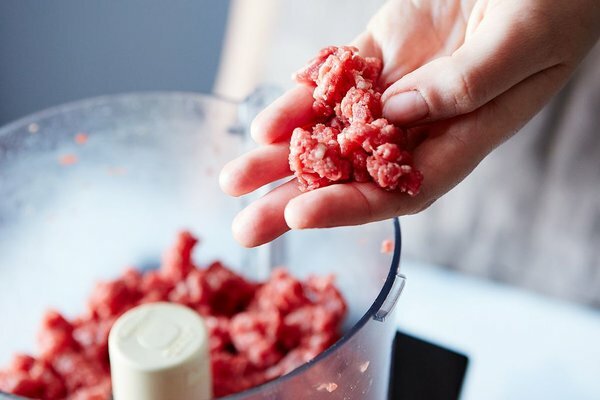 The handy pulse function will be helpful in this regard to ensure that your ground meat isn't reduced to a paste. Then just dump the meat onto a baking sheet, repeat with the next batch and you've got yourself a fine helping of fresh, home-ground meat. Because you'd be using raw meat for this job, make sure you wash the bowl and blade by hand. Just to ensure that there's no residue of uncooked meat left inside. A helping of breaded chicken is a tasty alternative to traditionally cooked poultry. But much like pre-ground meat, the freshness of pre-breaded meat is out of your control. With a food processor at hand, that is no longer a problem. If you have fresh bread to spare then by all means use that, but bread that's gone slightly stale is actually perfect for this too. Either way, you're going to want to stick it on a baking tray and place it in a 300 degrees Fahrenheit oven for about twenty minutes first. This will dry it out in preparation for the processor. For this job, take out your trusty S-Blade and attach the Shredding Disc. Power up the motor, feed the bread through the tube and it will turn to crumbs right before your eyes. You can coat a chicken breast with it straight away if you like. Or you can bag it and store it in the freezer for future use. So it sounds like we're pretty much fed you for lunch and dinner. 'But what about dessert?' I hear you ask? Make no mistake about it, your food processor has got you covered for that too. Do you scream for ice cream? You do? Well you're in luck because your food processor is hearing you, loud and clear. First you'll need your ice cream base, so get a large dollop of heavy cream in a freezer bag and stick it in the freezer for a few hours. When it's frozen, break the base up and unload it into the work bowl. The S-Blade is your guy for this job too. Before you set the motor running, add whatever flavouring to the bowl that you see fit. Chocolate, vanilla, caramel, or even horseradish if you're one of those people. Then you're good to start the machine and let it run until you've got a smooth blend. You'll want to store it in the freezer again overnight. But don't worry, when you're tucking in to that fresh batch of home-made ice cream it will definitely be worth the wait. As you can see, there's a ton of different ways you can put your food processor to use and a lot of healthy recipes that a food processor makes that much easier to prepare. And this is still barely scratching the surface of this magnificent machine's capabilities. Older PostFood Processors vs Blenders: Which to Pick?